Following the fall of the Roman Empire, there were very few cities. However, as trade expanded around 1000 AD, cities began to reappear and repopulate. These first medieval towns developed around a castle (burgh) or manor where the residents could go in case they were attacked. Also, they were constructed near rivers where they could be protected by a drawbridge. The residents of these towns were vassals(subordinates) who were under the control of their lord or king. At this time the vassals were known as burghers or the bourgeois. The aristocrats liked having the towns sprout up around their castles because they provided a ready supply of tax paying soldiers. It did not take long before many of lords started to recognize the profits in having a city. Cities made it possible for them to raise money through taxation. During the Middle Ages approximately 80% of the money raised by towns/cities was spent on militia, armaments, moats, and defensive walls. Before long, the populations grew and the towns built fortified walls, churches, and schools. 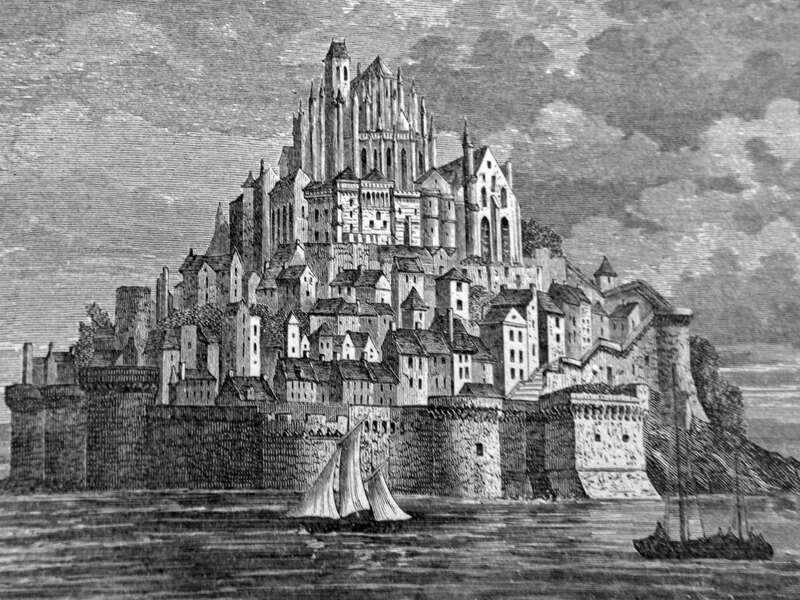 The typical town during the Middle Ages was a series of concentric circles that marked each stage of growth. In the center of the town was the market square, church or cathedral, clock, and town hall. The cobblestone streets were narrow and constructed for pedestrian use. They were likely to be higher than the houses. Maintenance on the roads was paid for by a tax on carts that entered the town. Homes were usually constructed according to the types of building material that was available. Homes in London and other cities were prone to fire because they were made out of wood and contained thatched roofs. Fires were in London were so frequent that the city maintained hooks to pull the burning thatch onto the street. This is where the name hook and ladder companies comes from. Eventually, the fires forced London to rebuild the city using tiled roofs and stone walls. Medieval houses lacked air, light, and basic comforts like sewage systems. Only the largest cities had sewer systems. However, they were unable to purifying the sewage. Instead, it was dumped raw into the local river. Tasks like street cleaning and household garbage were usually left up the the home owner. However, the city of Paris which had about 100,000 inhabitants had garbage police or “maistre-fifi” who called on homeowners when things began to smell. Almost all of the garbage was first thrown into the street. This included what was leftover from the city market days. They did not use garbage cans like we do today. All cities had a municipal water system, however that did not mean that the water was safe to drink. In most cities the water had to be boiled first. During the Medieval Ages most people passed the time of day on the streets where all of the daily action occurred. Each street featured its own trade, for example there was Shoe Street and Window Lane. They were alive with vendors shouting, and filled with carts loaded with every type of produce available. Hovering high above the narrow cobblestone streets rose the Gothic spires of the local church whose bells rang all day long. In the afternoon many of the men headed to the local tavern to hear the local gossip, while women gathered around the public fountains that were used for washing clothes. Almost every city had a 9 o'clock curfew because it wasn't safe to go out at night.